Continuing in our three part series covering Republican candidates and their economic policies as they impact Iowa, we now turn to Texas Senator Ted Cruz and his key programs for business. Unlike Donald Trump, Cruz has a unique tax reform plan that calls for fundamental changes to the way taxes are calculated and collected in the United States. On trade, Cruz is in favor of free trade pacts like the TPP (Trans Pacific Partnership), but he prefers to have a Republican negotiate the details rather than President Obama. Finally, Cruz is against all federal energy subsidies including ethanol. While his tax reform plan and free trade stance are major positives for Iowa, his stance on ethanol would have a short-term negative impact on the ethanol industry and corn prices, but a likely longer-term positive impact on the Iowa economy as it reduces the state’s economic dependence on energy production. As a reminder, this is an unusual campaign year in that the majority of Republican candidates have released detailed tax reform plans. Clearly, this indicates a strong desire by Republicans to reform the tax code in order to simplify it and to enhance economic growth. Enact a one-time repatriation tax of 10 percent on all profits currently retained in foreign countries. Create a new “flat business tax” of 16 percent, levied on all business profits, rents, royalties, and payroll. This tax also applies to wages paid by nonprofits and governments. As is the case with Trump’s proposals, we need to remember that even if Cruz were elected, these proposals are several steps from being enacted; all tax bills of course need to originate in the House and be approved by the Senate. Moreover due to the dramatic shift in the tax code structure, these tax changes would likely take longer to enact than most proposals. Still, a Republican Congress would probably be enthusiastic about the growth-enhancing and simplifying aspects of these tax reforms. .
On trade, Senator Cruz has been a vocal supporter of free trade and “fast track” or TPA (the Trade Promotion Authority authorizing the President to negotiate trade agreements with an up or down vote in Congress) to expedite free trade deals. However, he did vote against TPA in 2015, stating he did not trust President Obama to negotiate a favorable deal. Subsequently, Congress did approve TPA with Cruz’s support and many of the details of the Trans Pacific Partnership trade pact were hammered out. . As of this writing, the 6,000 page TPP treaty has not been presented to Congress for approval. Lastly on ethanol and energy, Cruz has stated he is against all energy subsidies. 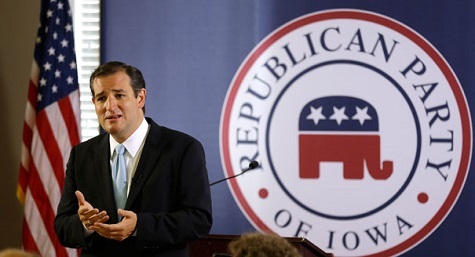 In an op-ed in the Des Moines Register on January 6th, 2016, Cruz states he opposes government subsidies. “…I am a passionate supporter of a free and fair energy marketplace. My view on energy is simple: We should pursue an “all of the above” policy. We should embrace all of the energy resources with which God has blessed America: oil and gas, coal, nuclear, wind, solar, and biofuels and ethanol. But Washington shouldn’t be picking winners and losers.” Cruz goes on to state he would phase out the Renewable Fuel Standard that mandates the amount of ethanol to be produced every year. Elaborating further, he said that he would remove the EPA’s blend limit against mid-level ethanol blends (E25, E30) to allow these producers to compete with low-level ethanol (E10) producers. To assess the impact of the Cruz plans, we’re going to focus on these top areas: manufacturing, finance and insurance, and exports (includes agriculture). For business tax reform, Cruz’s plan calls for a restructuring of the code to create a flat business tax of 16% on all business profits, less capital investment. It also eliminates the corporate income tax and all payroll taxes. This amounts to the full expensing of capital expenditures like building a plant or buying equipment in the year it is built or purchased. Furthermore, the replacement of the current corporate tax rate, which is 35% nominal, 28% effective, with a 16% business flat tax dramatically lowers the tax burden on companies. Consequently, the cost of business investment would decline significantly. If and when this tax proposal makes it through Congress, it will greatly increase companies’ incentives to save and invest. Like the Trump plan, the Cruz plan ends the untaxed deferral of overseas profits and initiates a one-time 10% tax on monies currently held in foreign countries. Going forward, overseas profits would then be subject to the 16% tax. The Cruz plan effectively eliminates the majority of other corporate tax provisions like interest expense from debt and credits for R&D, but the combination of a low tax rate with full expensing would outweigh these more secondary tax advantages. .
Summing the tax changes up, the Cruz plan would benefit Iowa’s top three business sectors significantly due to his provisions for lower tax rates and full expensing. There would be some costs associated with the changeover to a new tax reporting structure, but these would be minimal compared to the anticipated gains. For manufacturing, the full expensing would greatly reduce the cost of investment because managers could fully deduct the cost of any investments in plant or equipment in the year they are made instead of depreciating capital expenditures over 10, 20 or 30 years. Similarly, financial firms would lose the deductibility of interest costs, but they would benefit from the lower tax rate and increases in capital formation. For the export sector, the Cruz plan removes the current tax code incentive for firms to keep profits overseas and to use those profits overseas for capital expenditures. While we can’t be certain that all foreign profits would be moved back to the United States, the current 35% tax on dividend repatriation is a powerful disincentive to return these profits back home. However, there are some business negatives to the TPP, as it would open up domestic auto and car part sectors to increased competition from countries like Japan. Moreover, increased competition should equate to lower prices for consumers, but lower profits for companies. According to a 2015 World Bank study, the GDP of countries participating in the free trade pact would increase on average by 1.1%, although the GDP of the U.S., Canada and Mexico would only increase by 0.6% in this projection. If Cruz were to follow through in supporting free trade, a wide range of important Iowa industries would benefit, leading to a growing state economy. Offsetting some of the trade benefits for Iowa, Senator Cruz is against all energy subsidies including the Renewable Fuel Standard, which mandates production levels for ethanol. According to the Iowa Corn Growers Association, 47% of Iowa corn goes into ethanol production and Iowa leads the nation in ethanol production, creating 30% of all ethanol produced. Without a mandate by the federal government to blend ethanol into gasoline, there would be a significant decline in the amount of ethanol produced, leading to losses for the ethanol industry and lower prices for corn due to lower demand. In the short term at least, t this is a major negative for Iowa. . In the broader scheme, there are current problems with the RFS mandate as production levels are exceeding demand for ethanol. Crucially, the dramatic drop in global oil prices has further dampened demand and prices for ethanol. . Lastly, the Renewable Fuel Standard was created to assist the US in becoming energy independent through the development and use of biofuels, as well as to reduce greenhouse gases. Given the radical change in oil and gas production levels in the US from shale, this goal is not nearly as relevant today. In other words, changes in the broader landscape have already gone a long way toward reducing ethanol production and profits for Iowa corn growers and producers. As pointed out in the first article, Iowa has a vibrant, diverse economy that is in many ways a microcosm of the entire US economy. Therefore, changes to the US tax code and trade matter significantly to the state. Candidate Ted Cruz has drafted a plan to reform the US tax code with significant structural changes while maintaining his robust version of a free trade policy. The combination of the two would greatly benefit the major sectors of the Iowa economy with minimal downside costs such as those associated with losses of current tax expenditures like R&D and the deferral of the repatriation of foreign profits. However, the elimination of the RFS and the negative impact on Iowa corn growers and ethanol producers will have a detrimental short-term impact on the state’s economy. The thought of zeroing the corporate tax rate excites me, but I just don't see why Cruz is even pushing it, just not feasible. In terms of CTR Ryan, Rubio and Trump are aligned, more so with Rubio it seems so we may have a shot at reducing it if we can keep legislative majority. I just wonder if Cruz is trying to one-up Trump in this case. Great synopsis Andrew, fun read. I think this is not a mirage as I’ve not seen this many, detailed tax reform proposals from this many candidates. As well, Speaker Ryan wants to address international tax reform to end the tax inversions that continue to occur and erode the US tax base. Thanks for the kinds words! Great analysis. I'm starting to see that candidates are trying everything they can just to stand out from the crowd. It's a shame that these elections have become such a popularity contest, with candidates saying anything just to get elected. Those who are running may pick an extreme stance on a particular subject in order to stand out and get attention, but then must take a more balanced stance on a different topic in order to not singled out too easily by the other candidates. For instance, in Cruz's case the article outlines his intention of eliminating corporate taxes and creating a new flat tax under the guise of helping to stimulate hiring and economic growth (when really he's just helping his rich corporate buddies keep more for themselves.) On the flip side, the article mentioned that Cruz is in favor of TPP (Trans Pacific Partnership) and even making it a faster process to enter into more trade partnerships, when all this would do is send all the jobs away from the country where wages are much lower. Then there are the things that are the same across all candidates, such as eliminating subsidies for any type of energy competing with friend's of Republicans in the crude oil sector. Interesting article! Andrew, I am wondering what is your take on the fact that Ted Cruz may, or may not, be eligible to even run for President of the United States? Last I heard he was born in Canada but his mother was born in the United States, and that the original constitution disqualifies anybody from running if they were not born on U.S. soil? Is there an issue with this, and if so how may it come into play later on during the elections. Thank-You for laying out in detail which industries will benefit from a Cruz win so that it is easy to compare which ones would be winners Vs. losers. I have to wonder where his interests really lie and even whether or not there are any back-room deals going on. A) As your article mentions, many candidates have released very clear and detailed reform plans. This almost feels as though somebody has decided for them what to say. Cruz's tax cuts will enable businesses to come back to America and with that, the profits they make. With the extra money that businesses will be able to save, they can use that to reinvest into their companies by expanding, hiring more workers, and increased R & D. American businesses can be on the forefront of innovation again. However, as Robert states, is Cruz even eligible? I hold the same point of view as he does.